New Jersey Drops in the Rankings. Again. 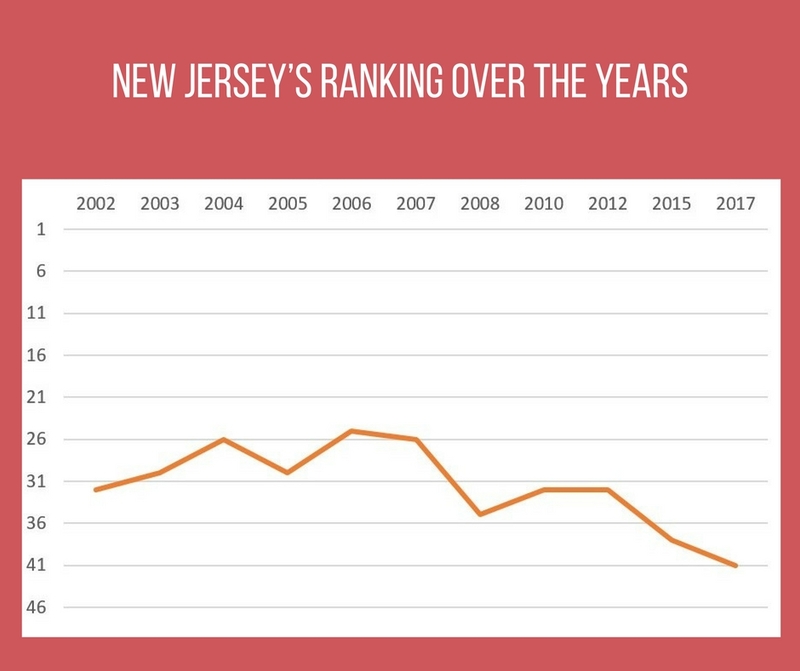 A new survey from the U.S. Chamber Institute for Legal Reform ranks New Jersey’s legal climate as one of the worst in the nation. 41st in fact. This is a drop of three spots since this survey was last conducted, and it is the lowest our state has ever ranked since the Chamber started doing this survey in 2002. Our downward trend is troubling because 85% of the executives and attorneys surveyed report that a state’s litigation environment is likely to impact important business decisions at their companies, such as where to locate or to do business. The low opinion business leaders have about New Jersey’s legal climate is disappointing, but not particularly surprising. Since this survey was last conducted, our state courts have issued several opinions on arbitration and the admissibility of expert testimony that are out of the mainstream. Since 2014, the New Jersey courts have been holding arbitration agreements to a different standard than is applied to contracts generally. Earlier this summer the appellate division released an arbitration decision that appeared to call into question the validity of check the box contracts. New Jersey has also been a national outlier on standards for admissibility of expert testimony. In July, the Appellate Division issued a significant published opinion, which if upheld by the New Jersey Supreme Court, all but eliminates the existing, critical gate-keeping role of trial court judges on admissibility of expert testimony. This outright prohibition on the sort of rigorous scrutiny applied almost everywhere else in the country would make New Jersey the jurisdiction of choice nationwide for claims based on unreliable expert testimony. Our lowest ranking is on prop ortional discovery. The New Jersey Supreme Court’s Civil Practice Committee mentioned in its 2016 report that it was taking up this issue. The committee’s next report is scheduled to be released in spring 2018. Speak up. The New Jersey Civil Justice Institute’s amicus program is an effective way to communicate with the court. 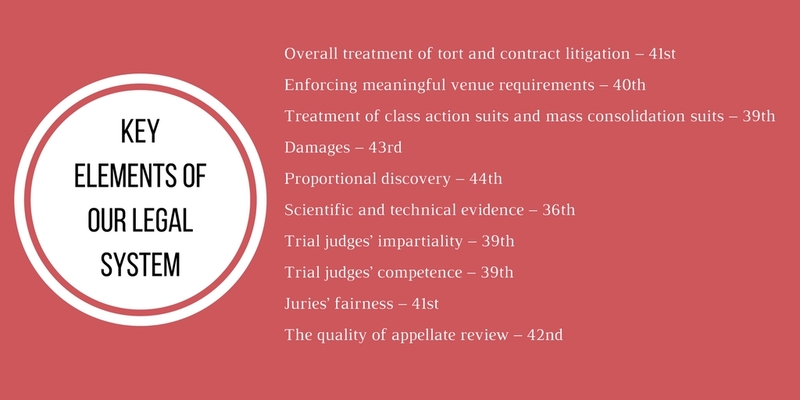 We are always looking for cases we think will have a broad impact on the legal community, and we encourage litigants to let us know about any cases and issues of interest. Participate in judicial rulemaking. Engaging the court in a dialogue outside of the courtroom is also important. The New Jersey Supreme Court has several committees it relies on for advice about court rules and polices. Serving on these committees, providing information to committee members, and commenting on committee reports is critical. NJCJI regularly gets involved with the rule-making process, and we encourage all of our members to do so as well. It’s an election year. Last year we saw judicial appointments become a significant issue in the presidential election. Well, this year is an election year in New Jersey. When you meet candidates for governor, assembly, and the state senate, tell them we have the 41st worst legal climate in America and ask them to do some thing about it. Quality judicial appointments and good legal policy could dramatically improve our state’s reputation. Legislature can lend a hand. The legislature could play a role in improving our state’s legal climate by passing one or all of the following budget-neutral, bi-partisan bills. Passing this legislation would send a signal that our state’s legal climate is a priority for policy makers. If there is any good news in the survey, it is that opinions about state courts are rising overall. When this survey was first conducted back in 2002, the overall average score out of 100 for all courts was 52.7. Today, the overall average score is 67.5. This is a tremendous improvement, and evidence that critically examining our courts and insisting on improvements gets results. There is no reason why New Jersey’s court system should hesitate take a hard look in the mirror and see where there are areas to improve. 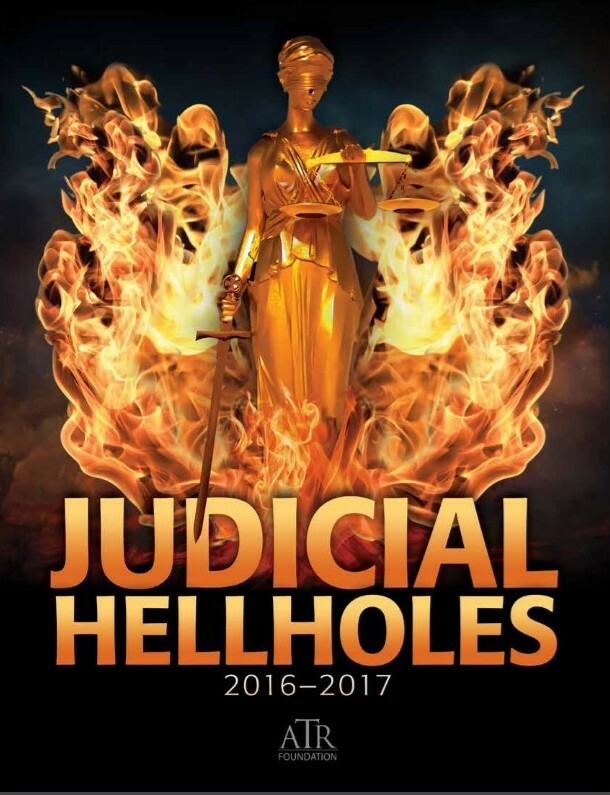 The American Tort Reform Association has released its annual “Judicial Hellholes” report, and New Jersey is near the top of its list. ATRA notes that our state’s consumer protection laws are far from mainstream, and our court system is becoming hostile to arbitration agreements, in direct contravention of federal law. “The arbitration-related decisions the report highlights are really concerning. The New Jersey Supreme Court has weakened the right to arbitrate in New Jersey, in direct violation of federal law, despite the fact that arbitration is faster, cheaper, and just as fair as going to court. This is especially true when you consider the alternative to arbitration is often class action litigation, where the biggest beneficiary is the attorney bringing the case,” said Rayner. 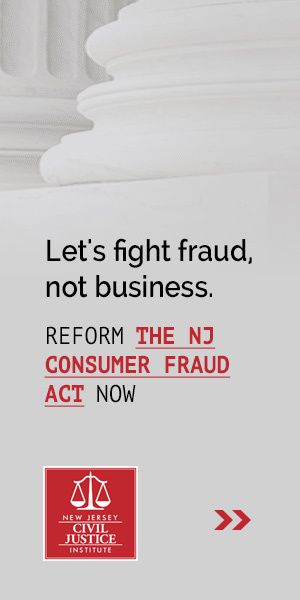 “When it comes to consumer protection, we’ve been saying for years that New Jersey needs to enact some common sense reforms to bring our law more into the mainstream. Our main consumer protection laws, the Consumer Fraud Act (CFA) and the Truth-in-Consumer Contract, Warranty and Notice Act (TCCWNA), aren’t giving consumers appreciably better customer experiences, but they are inspiring lots of litigation. For example, CFA litigation increased 447% from 2000 to 2009, but there’s no evidence there was more actual fraud to fight during that period,” said Rayner. “We need to take concrete steps to right our course and improve our state’s legal climate before it’s too late. We have a list of 11 legal issues New Jersey should tackle if it wants to improve its reputation and economic outlook,” concluded Rayner. 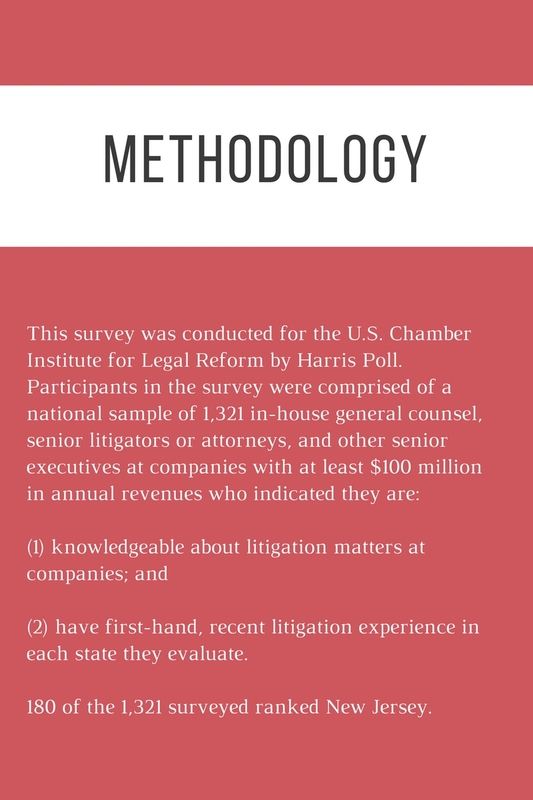 The U.S. Chamber of Commerce’s Institute for Legal Reform has released its latest survey of state legal climates. 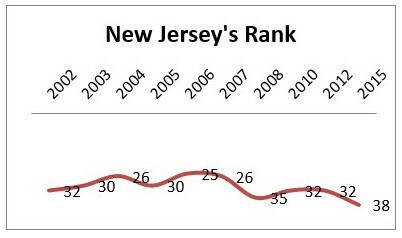 Unfortunately, New Jersey’s ranking fell to 38 this year, down from 32 in 2012 when the survey was last released. This is cause for anxiety in a state that is struggling to grow its economy since the survey also found that “75 percent of attorneys at U.S. companies say a state’s lawsuit environment is likely to impact important business decisions at their company, including where to locate or expand.” That is an 18 percent increase from eight years ago, and an all-time high. Is Litigation the Best Way to Regulate Business? 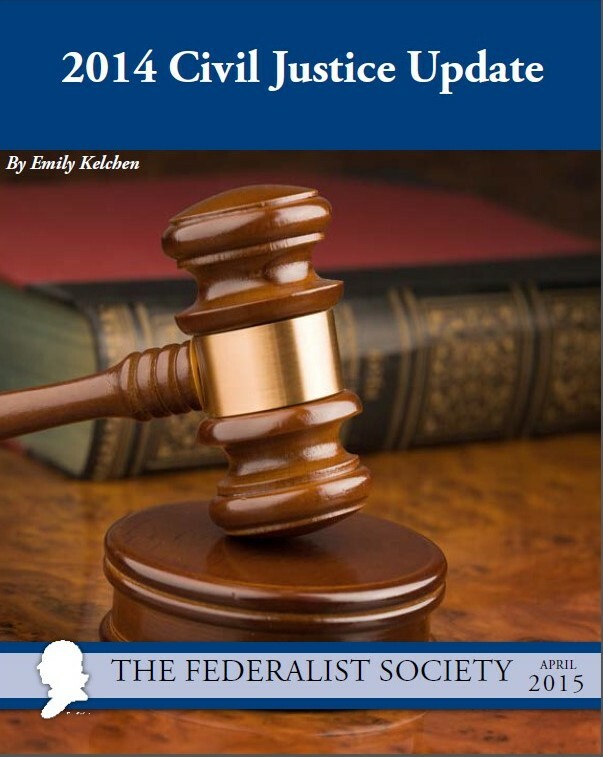 A white paper recapping important legal developments in the civil justice movement that occurred in 2014 has been published by the Federalist Society. Part I of the paper focuses on broad trends, Part II provides an overview of new legislation, and Part III highlights court cases from across the country that either strike down previously adopted reforms or adopt novel legal theories of interest to reformers. The paper was authored by NJCJI’s Emily Kelchen.